This recipe is one that we have made many times. It is a light and refreshing dinner. Be sure to check out the original recipe, as I make this one as written. Lentils are a powerful protein source. One cup of cooked lentils has 18 grams of protein. Wow! They are also high in fiber and thus fill you up for fewer calories. Only 230 calories per cup of cooked lentils. Not to mention, they make a great inexpensive meal! Whenever I have lentils cooking on the stove, my husband comments on how good dinner smells. There is something almost meaty smelling about them. For a while I thought it was the smell of the bay leaves but even when I cook them without bay leaves, he still comments when passing through the kitchen. I think we just both like the smell of lentils! 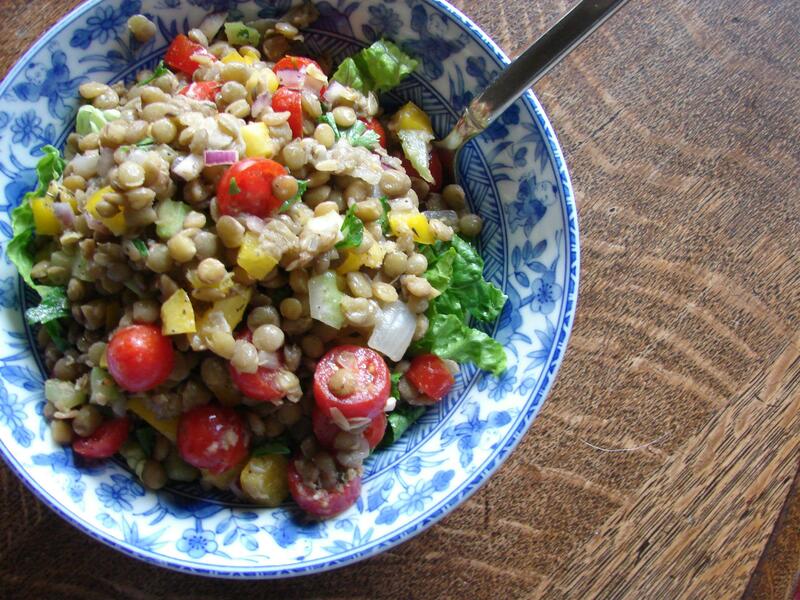 The herbes de Provence pairs well with the lentils and the cayenne pepper gives it a slight kick. We serve it over chopped romaine. And sometimes if we can’t wait, we will eat it slightly warm too. It tastes great both ways.